The Protected AAC audio files are only @ 128kpbs. Hence, you should match your import settings accordingly. Note that the total size of your playlist songs should not exceed the size of an audio cd. Create multiple playlists if necessary and repeat the steps 3 and 4 below for each playlist. Select the playlist and choose the ‘Burn playlist to Disc’. 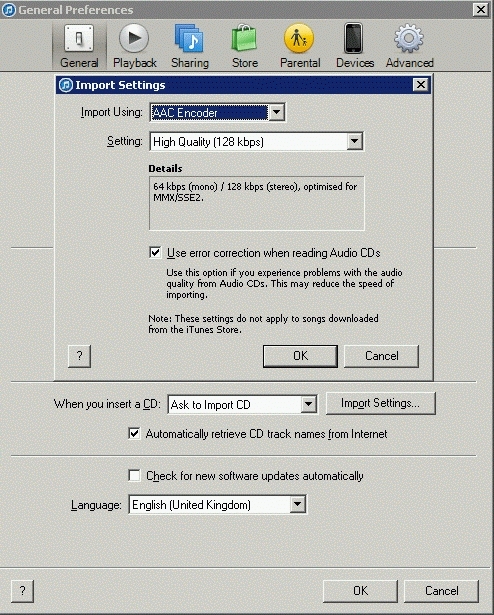 Make sure you have tagged the Audio CD option. Once the songs have been burned on the CD, do not eject the CD. If you did not eject the CD, the songs of your playlist will be shown as the CD contents. Choose to import the songs. iTunes will import the songs according your import settings in step 1. At the end of the import process you can eject the disc and your files have been created without the DRM protection. Posted by bioss at 7:41 pm on May 28th, 2013.